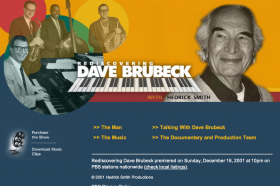 Rediscovering Dave Brubeck (2001) – An historical one-hour documentary of the legendary American jazz pianist Dave Brubeck, who is still going strong in his 80s, creating new music, constantly on tour, writing classical as well as jazz tunes. To purchase this video call the Marketing Department of South Carolina Educational Television 1- 800-553-7752 or write to SCETV marketing PO Box 11000, Columbia, SC 29211. A DVD with enhanced performance and interview features is on sale at record stores nationwide and through Amazon.com. It was produced for Hedrick Smith Productions through Image Entertainment of California.